I feel pathetic admitting this, but I’m not one to get embarrassed easily so I’ll share this tidbit with you. I spent WAY too many nights last year looking for a new daily work bag. I’m totally aware that the remainder of this blog post can best be defined as a #FirstWorldProblem. You see, I REALLY wanted the same bag that I used since September of 2008; however it was discontinued. The bag was perfect. Black nylon. Shoulder straps that didn’t fall down. It could hold a computer. It wasn’t overly branded with a logo. It had a zipper top and an inside zipper pocket. However, after five years and roughly 1,300 trips to the office (including business trips! ), my trusty nylon bag started to pucker and fray at the edges. I was in the market for something black and that met the criteria above. Knowing that this bag would hopefully last another 5+ years, I was willing to make an investment. I even saved money from Christmas and my birthday for the purchase lol. Knowing that I put a bit of time into my search, I wanted to share with you some of my finalists for the perfect work bag in case you are considering a purchase. 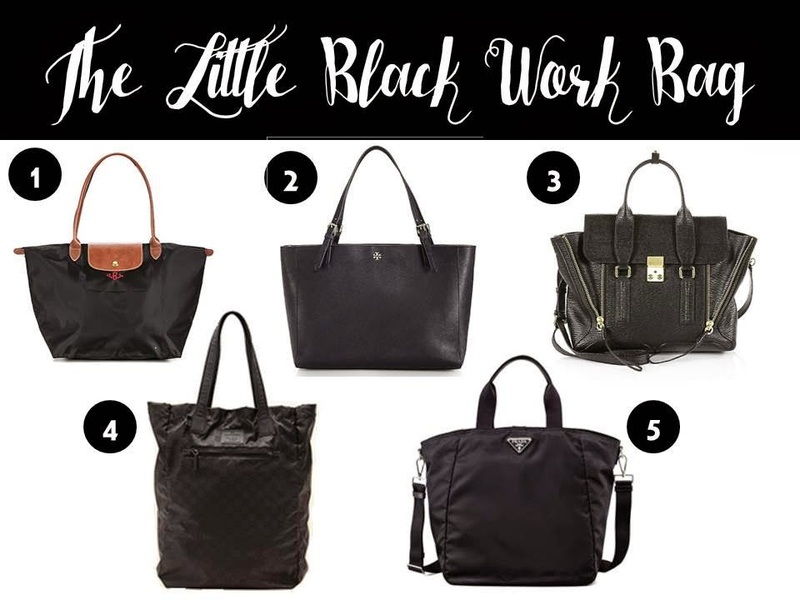 Longchamp – I wanted all black and I ultimately decided this bag wasn’t big enough. Tory Burch – Despite the adjustable straps, the stop was only 10 inches max. My former bag had a shoulder drop of about 12-13, which kept it on my shoulders – even over a winter coat! 3.1 Phillip Lim – Before you choke on the price of this bag – which is more than some people’s rent/mortgage, let me say that it went on major sale when I was considering it. I thought this one was a little edgy, but still classic compared to the other options I was evaluating. However, I skipped on the deal because it couldn’t hold a laptop. That shoulder strap was enticing! Gucci – Online I was excited that this bag was a nylon shopper like my former fav. However, I swung by a Prada store and walked away from this idea. The sales associate basically led me to believe that the nylon was SUPER thin – reminding me of a nylon reusable bag that I have that folds up and you put into your purse for unexpected shopping trips. NOT worth the price tag! Prada – Okay so this isn’t totally the one that I had my eyes on. It was a little like this, but more tote with longer straps (still only a 11 inch drop). The one I was looking at was half the price of this and then went on sale for even half of that. I called Saks to try and find it when it was THAT deeply discounted and they got one in two weeks later in black…but I already purchased by other bag. It’s “totes” okay though – I’m happy with my choice! The bag I selected isn’t included in this list because frankly it’s a bit tricky to find online. I seriously lucked out and bought it the day it went on sale in the summer and then it was backordered until December. Let’s say that it meets almost all of my criteria, however it doesn’t have a zipper and it’s something I’m still adjusting to. While it’s leather on the outside, the inside is rubber – which I’ve found to be AWESOME to clean off! So while it wasn’t everything that I had hoped, I found a new quality that I love!